how I found my hammies in a room full of grannies. I stayed for the entire class. “ABSOLUTELY NOT.” chirped up one of the more senior class participants. I’m going to get along with my new friends just fine. Caution: Old man at the wheel. I just LOL’d soooo loudly that the cat got scared and ran to hide! Senior people are a hoot! I don’t know how you didn’t just burst out laughing. I need to know where this yoga class is because it sounds like it’s right up my alley. I have a hard time with some of the positions in traditional yoga. This is probably one of my favorites ever. I love that you stayed. You’re such a spring chicken, Casey. This is why we would be friends if we lived on the same side of town. OMG! LOL! This was just what I needed today, a little something to giggle at! And I love picturing you taking that picture in stealth mode. Can you imagine getting a stern scolding from the grannies if they realized they were being photographed? @Kelley, Child’s pose is an excellent stealth texting pose. @Casey, Haha, good to know. It’s funny you mention child’s pose – I was just writing yesterday about crying (well, okay weeping) in child’s pose during my first attempt at sleep training my daughter. And I just read your previous post about being depressed. Hang in there girl, and thanks for using your space here to help reduce the stigma associated with depression. Sending you good vibes. one of my favorite posts thus far! I would have done the same thing! Making new friends is my forte, and obviously yours! No matter what age! LOL. I completely agree about the hot air balloon. I’m glad you stayed! I think we’re fairly close in age and I am in a Bookclub with a bunch of ladies in their 70′s and 80′s. I adore every second I’m with them! They give me such a good perspective on life, family, history, God, etc. they’re a blessing … And very funny too! I went to yoga yesterday for the first time in at least 5 years. It was great. I forgot how great I feel at the end of a session. Ps. About Starbucks- I don’t drink coffee either. I do the love smell and their teas, though. 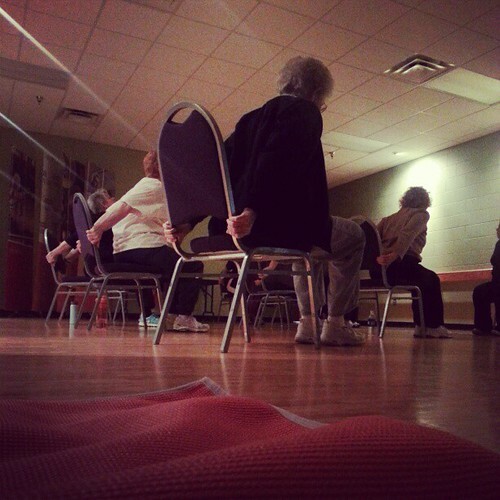 As a yoga teacher: people often underestimate how challenging a chair yoga class can be. That sh*t is hard!! There are so many things I love about this. SO MANY THINGS. Way to move directly to the head of the class!